We’re taking a look at the USA men’s soccer jerseys of the last 25 or so years, not only to provide a bit of history, but also as a bit of a refresher before looking toward the future of the USA’s kit. My main complaint about the USA kit is that there’s no continuity. Unlike most national team kits, the design has changed drastically each time adidas or Nike has unveiled their latest designs. Whether it’s red, white, or blue, stripes, sashes or denim, you’ll see below that the designs are all over place. I know that I’m nowhere near the first to say this, but I really think that in order to develop a team identity, we need to have a consistent template for (at least) the home jersey. I’ve always favored the red jerseys in general. It’s good, bright color for fans to wear. Really, I’d rather have it as our home color, but US Soccer seems hung up on having white home jerseys (which have always seemed kind of bland to me). I guess it’s fitting that the USA would wear whites at home since it’s the traditional home color in most American sports. Below, we’ve got images of every home and away kit since 1984. I’ve offered a brief commentary and grade for each shirt. Obviously, I’m not attempting to be objective in any way. If you disagree, make it known down in the comments section or in the poll at the end of the post. Great comprehensive write up! I’ve never seen such a complete evaluation of all the recent U.S. uniforms, and dating back to the 80’s was a nice touch. It’s also a nice way to get the Charlie Davies tragedy off the mind. Thanks for the feedback. Glad you enjoyed the post. Oops! Thanks! It has been corrected. I’m with ya, those modern day THIRD kits need to be the new home kits! The 1990 WC USA Crest would be great to use with maybe a tweak of the design and a color update. I’m very open to a new US badge. The flying ball, much like the Toronto Raptors’ logo, seems to be stuck in the early-to-mid 90s. It’s not offensive, but I think we could find a design with a longer shelf life. Couldn’t agree more… the real problem is the badge. It certainly isn’t necessary to put either “US” or a literal representation of a soccer ball in the design. It looks amateurish. Start by changing that, and let the design of the rest of the jersey flow from it. By way of example, the Dutch jersey of a few years ago and the English jersey this year look very smart, giving a clean, classic look with the only ornamentation being the occasional narrow stripe and a very cool emblem. The diagonal sash look would be perfect with a decent badge, or even no badge at all. I’m also a big fan of collars. The third color shirt from the 1995 era was made light blue because it was apparently difficult (referees were complaining) to read the numbers on the back of the jerseys with the other color schemes. The idea with the light blue was to try to make the numbers more visible. IIRC, it was only worn once (the 1996 US Cup finale vs. Mexico, a 2-2 draw.) The decision seemed to be that the light blue didn’t do enough to increase the visibility of the numbers. Thank you for not repeating the error of the SI editor who claimed that it was a “lack of confidence” that had the US switch from the Denim and Stars to the Red and White stripes for the second round of WC94. It was, in fact, a motivational factor: the team pledged to not wear the stripes until the second round, giving an incentive to get there. RE: 1994 stripes–you’re completely right. I missed the fact that there was no white option in 1994. The idea was not the overall color of the shirt providing more contrast, but the middle stripe. Since the blue away shirt had white numbers on a red middle stripe, the idea was that it might show up better white number on blue stripe. (The Home white had red numbers, so presumably they might have tried blue numbers on that instead of red?) But the white numbers didn’t really show up better on the blue than the original away shirt IMO (I have the one game it was worn on tape) AND, the numbers were *less* visible on the rest of the jersey because it had less contrast with the light blue, which was tacitly admitted in that the letters of players’ names were done in dark blue. I see what you mean. I remember watching that match and thinking the light blue didn’t really read well on my old TV. Strange jersey. I agree…that might be my favorite set of jerseys. I really like the red with the sash from a couple years ago, but we only got to see that for one game. I’d love it if Nike used that horizontal band motif on all our jerseys in the future. 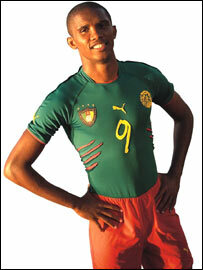 Also, FWIW, one of the GK jerseys of that era was a red version of those shirts, and looked quite nice. The other was a sort of silvery gray which I didn’t think as highly of. I love the 06 red one, but I don’t think you can really even call it a third; it was a one-off that was auctioned off for charity after the game (one of the send-off games before the WC) and, I think, never actually made available for sale. It was the Don’t Tread jersey, which I think was the first time Nike actually incorporated the Don’t Tread logo into the design of the shirt. You’re right. I was just calling anything that wasn’t a home or away a “third” for simplicity. I don’t really know what technically qualifies a jersey as a third…but it probably requires wearing it more than once. I do believe the Don’t Tread shirts were on sale for a short time before the world cup. The Don’t Tread jerseys were for sale, I believe. I’ve seen people wearing them. They were for sale, but Nike only made a small run of them and they sold out very quickly. I still kick myself for not picking one up, as they go for well over $100 on eBay nowadays. I’ve heard that Nike is looking to go retro for this world cup. I wouldn’t be surprised to see a white with a red or blue sash home shirt next spring. I’m still kicking myself, too, for not picking up the don’t tread shirt. I so loved those 2006 Third Kits, I was at the farewell game and thought they would be the WC kits. I was wrong and am an idiot for not getting my hands on them when I could. By far the best jersey we ever had. Great design, great color. Which one? We’ll try to find a picture and add it in. I love our current jerseys right now, they’re clean, not too amateurish, modern, a bit unique, and they keep the american tradition of wearing white for home games, but i would like something just a little bit more retro, to give that classical distinct feel. I think trying to incorporate the american stars n stripes would be great, but not something that looks like we put holes in some flags and made it a jersey. I really want our national team to have a unique jersey that says ” I’m an American, and I’m proud of it” , because i hope one day i get the opportunity to play for my country. The USA Team should use the 1950 Shirt. Classic and timeless taking us back to a great time in US History and the greatest US victory. does anyone know the number font of the 2008 home jerseys? so they’re making new jersey for this year? yup. i think it’s supposed to be released this month. maybe it’s debuting at the Netherlands friendly…? seems like something they might do. The home jersey’s should stay white. White shirt, shorts, socks. In its own way its distinctive, as is navy blue for the away kits. My gripe is that every country seems to wear red these days, just look at all the teams in Euro 2008, you couldn’t tell one from the other England, Switzerland, Spain, Croatia, Czech Republic, Germany, etc. We’d just be a clone of the others, like when every NHL team switched to black/super-dark home (i still consider them away) jerseys a few years back. USSF should just settle on a design and color scheme though already. The sash works, I just hate it when they dramatically change the designs (graphite?) from year to year just so Nike can make a buck off of our backs. (Nike does make pretty good jerseys though – even the bad ones). Dont know how old this is but thanks for doing it. I bought the ’04 away on ebay for 20$ new and had no idea when it was from (though I love it). Glad they went retro, hope it sticks. USA. a really good history lesson of the USMNT soccer jerseys! nice history of the USMNT jerseys.. I know this is an older post, but I must disagree with us wearing red. I like that our unis are white or blue – think of it this way, in North America there are three big countries, all of whom have red and white on their flags. Canada has just those, so leave red to them. USA have blue as a third color, and Mexico green. Mexico plays this up by wearing green home shirts. We tend to use blue for the secondary color (shorts, stripes, etc) at home and main color on the road, with just a bit of red throw in on either. Maybe some odd logic, but that’s why I prefer the USA to be more blue than red. 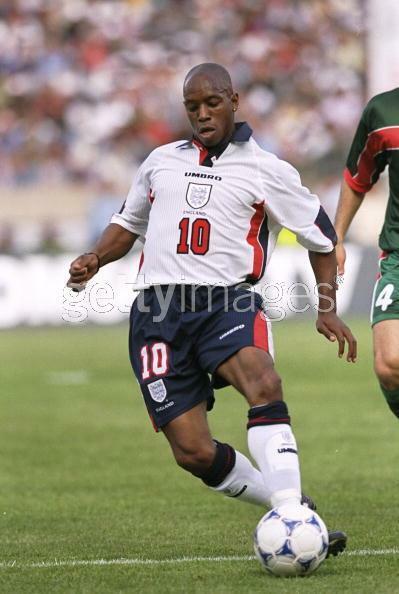 I suppose you could call the 2002 jersey a rip-off of England’s jersey, given both use similar colors. But I believe that was Nike’s standard jersey for 2002 and used by many countries, including notable teams such as The Netherlands, Brazil, Mexico, and Portugal. That’s also where this blog currently lives.